Before clubbing was a thing it was all about the beats and the party. In the late 80’s early 90’s electronic music was synthesized punk as apposed to v-neck t-shirt wearing, fake sun tan, Prosecco endorsed nonsense. This is not to say that banging rave’s no longer exist, rather that this once landscaping altering sound has become, in the most part, overly homogenised and devoid of originality. 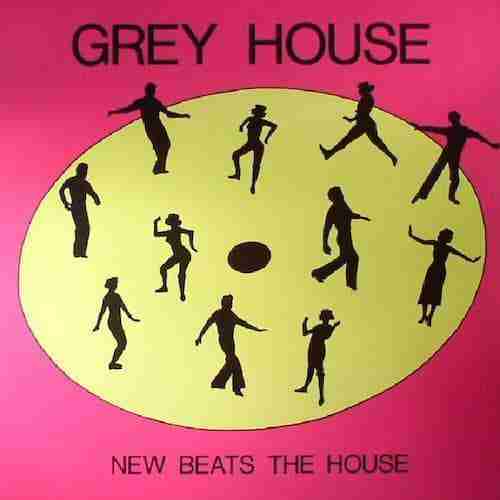 A reality that means the majority of the current generation of clubbers no longer get to experience the thrill of what 1989’s ‘Grey House – New Beats The House’ embodied. So what makes ‘New Beats The House’ so thrilling? Well consider its 1989, there’s no YouTube, Beatport, Internet or Smart Phone. Not to mention that most people don’t own a record player let alone a drum machine or synthesizer. Clubbing essentially doesn’t exist and if you were out to dance, chances are that, particularly in the UK, the music was mostly guitar led. Which means you would have never heard this record, and the only way you were ever going to hear it was by attending what was most likely an illegal warehouse rave. A rave that unless you were in the know, you were never going to find. Yet somehow like when you eyes lock with someone truly beautiful and they return your gaze with an unexpected heart lurching smile, you stumble across it. A thrill that only an unexpected discovery can elicit. Unfortunately ‘New Beats House’ pounding 4/4 beats and infectious 303 hook are unlikely to have quite the startling affect they did in 1989. However if you want a record that truly represents that original ‘Punk Spirit’ of electronic dance music and delivers an acidic 303 hook that doesn’t sound clichéd or contrived, then look no further than this remastered reissue. Available now via [Phonica Records] + Jared Wilson Remix.